We all know amazing women and mothers who’ve made great sacrifices for their children. Moms in Ethiopia are no different, where thousands of women give nearly everything they have, including their health, to provide their kids with a better future. An estimated 400,000 women in Ethiopia process hot peppers by hand—a laborious procedure that turns fresh peppers into higher-value products of dried flakes, seeds and powder. Women can earn good money selling pepper products, but the tiring work leaves her hands covered in hot pepper oil and her eyes, nose, and throat burning from pepper dust in the air. The work is debilitating; it often takes days for women to recover from the harsh effects of this process. Like all moms, these women hope their children can get an education, and they’re happy to sacrifice their health if it means their daughters won’t have to do the same. With your help, we can make these women’s dreams a reality. Students at Stanford University developed the Pepper Eater, a device that mills dried peppers with a hand-crank much faster than and without the side effects of the traditional method. The students passed their creation along to CTI where some of the students and other CTI volunteers modified the Pepper Eater and took it to Ethiopia for additional testing and feedback. To everyone’s delight, it produced pepper flakes more safely, efficiently and of superior quality to those produced by traditional methods. With improved safety and more efficient tools, women who process peppers for a living can earn more income to support their families and can avoid the debilitating health problems. We are establishing local partners in Ethiopia and are currently seeking funding so we can start building and providing Pepper Eaters for 10-20 villages for extended field testing. If you want to help us provide safer and more efficient tools, visit our website to learn more or contribute to our efforts to dramatically improve the health and livelihoods of thousands of Ethiopian women. Most of our crops are now in their 13th week of growth, and most of them are doing well. There has, though, been a fair share of challenges in achieving their success. Last year, one of the biggest challenges once the grain crops (primarily pearl millet and sorghum) completed pollination and reached their milk stage was a population of hungry birds that was eating away at the fresh grain. The team tried hard to deter the birds, using netting, noise makers, metallic streamers, and everything they could, but the birds only became more relentless in feeding on the grain. Well, those sparrows and other small birds are at it again. The bird issue was a large part of the discussion before the crops were planted. The team made the decision that this year we would bag the heads of sorghum and pearl millet as protection. Corn breeders at the University use special paper bags to prevent cross-pollination, and we were able to access some of those bags for the sorghum. Pearl millet, on the other hand, has a head that is much longer and narrower than the sorghum head. For that, we have used paper bags sent to us by ARS/USDA pearl millet researchers in Georgia. Though we were not totally sure about the effect that these bags would have, after a couple weeks, the heads that have been bagged are doing much better (untouched so far) than those without (see pictures below for visual). Of course birds are not the only pests running around our urban ecosystem. We’ve had bunnies chewing on the Bambara groundnuts. The Bambara groundnuts are looking sickly, but we’ve since fenced them so maybe we have some chance. We also have had to continue to fight a virus induced by leafhoppers in the legumes. Finally, we’ve noticed that the fonio is rather behind where we thought it would be by this point. Some of the team hypothesized that like finger millet, a crop from last year with a similar problem. Day-length sensitivity may be an issue (reproductive stage triggered only by shorter days than we have in summer), but so far we have not come across any conclusive literature. Obviously, growing season pests are a problem, especially when we have very little of each crop to begin with, but they’re not our focus in this project. Luckily, there are many researchers who are focusing on how to reduce pests and disease to increase healthy yields. With those increased yields, come tough questions on better post-harvest storage, market access, and efficient processing. Those are the questions that CTI is addressing, and as our crops get ready for harvest within the next month or so, I’m excited to learn more and test some of their innovative technologies. More to come on that! Meanwhile, if you live in the Twin Cities area, feel free to come visit the plot yourself (PDF with directions). If not, we’ll continue to do the best we can to relay the experience virtually. Last summer, CTI and the University of Minnesota (UMN) collaborated in growing six “Orphan Crops”: teff, finger millet, pearl millet, sorghum, grain amaranth, and groundnuts (peanuts). Orphan crops are important food crops for subsistence farmers in many African as well as Asian and South American communities, as they have a strong cultural importance, and are often more nutritious and drought resistant than many of the large commodity crops. Most agricultural research has focused on increasing the yields of commodity crops, such as wheat or corn. However, simply growing more food is not enough—not when between 15-50% of crops are lost after harvest, often due to post-harvest spoilage and inefficient processing methods. That is why CTI is committed to filling some of the gaps in the research by working on orphan crops, focusing on the post-harvest side of the value chain helping bring rural farmers out of subsistence living while improving their livelihoods. Tiffanie Stone, a recent graduate of the University, was the student intern on the St. Paul Campus plot last year with the guidance of Agronomy Professor Paul Porter and other UMN and CTI colleagues. This year, we are at it again, and I’ve joined the team, along with many of the great folks from CTI and UMN who originated the project. I’m Laura Dorle, student intern with the Orphan Crops project and a junior in the Environmental Science, Policy, and Management Program at the U. With a particular interest in food, agriculture, and international development, and a great desire to learn a lot more in those areas, this project was the perfect opportunity to do so. The plot has been off to a good start thus far. The crops were planted in late May. In addition to the crops from last year, we also planted cowpeas, fonio, quinoa, mung beans, and Bambara groundnuts. Most have been doing very well, despite heavy rains early and intense heat. As usual, there is group of stealthy weeds that are thriving right along with them, and a lot of volunteers have been out there working hard to battle them, the leafhoppers, and Japanese beetles. When the crops begin to mature at the end of the summer through the fall, we’ll be able to use them to do field tests of CTI’s post-harvest equipment including prototypes of groundnut processing technologies that are being developed for a program in Malawi and Tanzania funded by the McKnight Foundation. We will also be testing CTI’s new pearl millet processing suite on additional grains. I’m really excited to be working on this project. Be sure to stay tuned. More updates to come as the process continues! And we’ll be organizing some field visits starting in mid-August! CTI volunteer Natalie George is blogging from Haiti, where she’s joined her mother Dr. Camille George, CTI Board Member, Program Manager and Professor at the University of Saint Thomas. The George’s are in Haiti helping locals take advantage of an underutilized food source: Breadfruit. Breadfruit grows in abundance in Haiti, but spoils just days after ripening. CTI has developed a set of tools that villagers can use to preserve breadfruit as affordable flour. Natalie and Camille are in Port au Prince, helping Haitians open a breadfruit bakery and showing “field to fork” proof that breadfruit can be harvested, transformed into flour, and processed into delicious and nutritious food products. After departing the airport, we start driving to our hotel and I get my first glimpse of Haiti’s capital city. It reminded me a lot of Mali in West Africa, but with its own twist. The roads are half-paved, half-broken rubble and, the further you get into the city, the more broken and choppy the roads get. There are people EVERYWHERE and like in Africa, many of them transport their goods on their heads. However, their clothing surprisingly resembles that of Americans. The poverty level is extremely noticeable, more than I have ever seen in my life. I didn’t think that the earthquake’s destruction would still be evident, but it definitely still is. There are severely broken buildings with giant boulders of concrete all about, but there are also buildings right next door which are completely fine. I notice that there isn’t a road sign in sight. Instead, there’s spray paint on the concrete walls with a name and some numbers. The roads are so twisted I have absolutely no clue how people know where to go! Each building is surrounded by a giant concrete wall and then a huge metal door. To get inside people just beep a few times and then someone comes and opens this massive metal gate door. The concrete walls all either have barbed wire or cleverly have broken glass bottles along the top of the wall to discourage people from scaling them. On our first day, we wake up at 6:30am and it’s already 90 outside. Our friend Brulan navigates us through the twisty rocky roads, and we approach a random concrete wall and he beeps ever so lightly and someone opens the door. How will we run a bakery without electricity? Stay tuned for an update! Roger Wilson in Ethiopia testing a new prototype technology, the Pepper Eater. An estimated 400,000 women in Ethiopia process peppers by hand; a laborious procedure that turns peppers into higher-value products of dried flakes, seeds, and powder. The Pepper Eater (featured in National Geographic) is a device in development that mills dried peppers with a hand-crank much faster and safer than the traditional method of flaking peppers by hand. The Pepper Eater concept was developed by students at Stanford University, and was recently redesigned in a collaboration between CTI engineers and the Stanford team. CTI volunteer Roger Wilson and the Stanford team are in Ethiopia meeting with women who are evaluating the new Pepper Eater prototype. We set up today with the table across the street from the Encino Berbere market (Berbere is a pepper, or spice mixture that is a staple ingredient in Ethiopian cuisine). The crowd was instant. 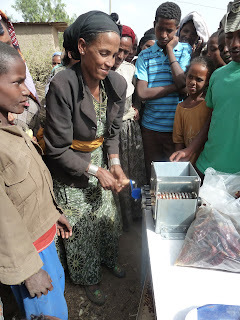 It took some work to get the children and men back far enough to let the women look and try the Pepper Eater (here called the Berbere Machine) and the grinder. I am working on trying to get shades of grey in the translation of the responses of the women because what I am getting is, “It is good.” I think that means it is fine; yes I can use the product, whether it be from the Pepper Eater or the grinder. So the Pepper Eater was liked. We did grind some of the Berbere that we had flakes with smiles and yes it was good. To demonstrate the grinder we not only ground Berbere, but used CTI’s prototype poly burr to break the husk and split peas, which were then winnowed by hand and we ground the split pea as normal with the metal burrs. The beans we cracked with metal burrs, winnowed, and then ground. The shiro (powder) produced by both the peas and beans caused eyes to light up and the comment, “That sure is easier than pounding!” One woman was excited and immediately wanted a grind with a motor; she had big plans quickly. Aschalech Jemal, a University Grad in Agriculture who’s working with me, said that word of mouth will transmit what the women say quickly so the demo will be pretty widely talked about. Another component she picked up on is that the success of introducing either of these technologies is dependent on Ethiopians making it happen. She has the vision that this does provide business opportunities in several different ways and venues. So far, our health has been good. The tomato crop is yielding well and thankfully the Project Mercy cook’s know how to make a safe and delicious salad that is often nearly half tomatoes. Just for fun they throw in the occasional Mitmita bit (Thai like hot pepper.) The locals seem to know pretty well when this are dry enough to work. Yesterday in the market was interesting because Asfew turned down many vendors because the Berbere was too flexible, i.e. washed and still too wet. We bought them at the Butajira market because the administrator here said the merchants were less flexible at the other markets and there was a choice here, which seemed to be true. At the end of the trip today, I asked that we stop in Butajira at the hotel so I could buy a drink for the five people that went to Encino. It cost a whole 25 Birr for 5 machiato (like espresso with steamed/foamed milk); mine was delicious. There is nowhere in the Twin Cities that I could get a coffee like that for myself for the $1.50, much less five people. So there are some good things lighten the rest of the work. If you’re reading this, chances are you’re just a few feet away from a source of clean, safe water. But if you lived in rural Nicaragua, you and your family would likely have no choice but to drink polluted water collected from local rivers and lakes. In a small village in rural Nicaragua, contaminated drinking water was making everyone extremely ill. Children were dying, their small bodies unable to handle the intensive dehydration caused by severe intestinal diseases. Then CTI’s water team stepped in and helped the village build a simple water chlorination system, and now the children are healthy, attending school regularly and enjoying life. CTI’s water chlorination system is now in place in 126 communities, serving 79,698 people. The Water Chlorinators are built from PVC pipes and valves costing just $100. Villagers maintain the systems and pay to replace their chlorine tablets. The chlorine kills the bacteria, so the water is safe to drink. Every child deserves clean drinking water. We are setting a goal of providing clean water to 250,000 Nicaraguans by June 2014. But we need your help to get there. A donation, in any amount, will help communities gain a sustainable source of water, and will help us give tens of thousands of children a better hope for the future. Breadfruit is a high-carbohydrate fruit that grows in abundance in tropical nations that struggle with hunger and poverty. Breadfruit has been long recognized for its potential to alleviate hunger in countries like Haiti, but there’s just one problem: fresh breadfruit rots in 48 hours. But if poor communities were able to make flour out of breadfruit, locally produced breadfruit flour could replace expensive imported cereals and increase food security. Compatible Technology International (CTI), with help from a team of engineers, researchers and breadfruit experts, is developing a set of tools that will allow villagers to process breadfruit into shelf-stable flour. CTI has designed a manually-operated shredder that shreds breadfruit into small strips that are optimally shaped for quick drying. Engineers at CTI and the University of Saint Thomas (UST) reached the current shredder design after testing other concepts with communities in Haiti. After they are shredded, the breadfruit strips must be dried quickly to prevent spoiling. To source the best technologies for this crucial step, UST recently organized and judged a contest challenging teams to develop a simple, effective and affordable breadfruit drying structure. The first place winner of the contest is a team of long-time CTI volunteers, and second place is a team from the University of California, Davis. In March, both teams will travel to Hawaii to present their designs at the Breadfruit Institute, a division of the National Tropical Botanical Garden. Once dried, breadfruit strips can easily be ground into flour by villagers using CTI’s grinder. The breadfruit processing system will go through rigorous tests at the Breadfruit Institute before being deployed in the Caribbean. Breadfruit flour could be an important microenterprise opportunity and an untapped source of nutrition for food insecure communities. With your help, we can get these and other innovations into the hands of the communities that need them.